PC Wizards are well aware of the frustration and irritation that can come about from computer that simply refuses to function and work the way you need it to work. With the countless work that computers undergo through trying to process all the requirements demanded by the user, the possibility for an aggressive virus can be apparent. At times with so many things on your shoulders, the safety of your computer can easily become overlooked and it can become an extreme difficulty and challenge to maintain awareness of the needs your computer might have such as the 100% protection from the multiple threats that are in existence daily. For this reason we have decided to step up and to become a threat for the threat! It is why we have become focused on becoming specialized in the industry of computer repair and laptop repair in the Lady Lake and the villages area which is located in the ever growing central Florida region, which now more than ever, at its population, is in need of these valuable services. 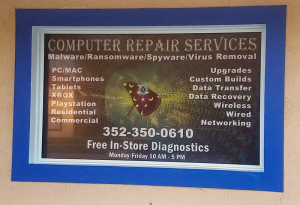 We would love to have the opportunity to show and tell our solutions in PC repair with all Floridians, in our service area of the Lady Lakes, the villages and Orlando, that has in their possession a broken or malfunctioned computer. Our goal is to not just bring the services that you and your technology deserves but also to become a loyal and trusted friend, partner and service who can bring to you solutions, service, convenience and satisfaction. How do we do this? We do this by going above and beyond! If you need replacements we will bring you the best of the best technology and giving you the best of the best technological advice that way you are in control and that you can become more empowered as a PC owner. Our technical experts, trainers, managers and web site developers have been a part of hundreds of positive testimonies with small businesses and families with all of their technical concerns and we look forward to being your next amazing testimony. Do not hesitate! Give us a call today and take initiative to service your computer as it has done for you.